There was a boisterous Texan who came to a border town Mexican bar. After much drinking he called for his bill. “It’s 100 pesos senor,” he was told. “Come again?” he slurred a little incoherently as he pulled out a thick billfold of dollars and waved it over his head. “100 pesos, senor,” the barman told him again. “No, in dollars,” he spit. The year 1994 was a violent one in Mexican politics. The assassination, among others, of the ruling party´s presidential candidate, and the guerrilla war that exploded in the state of Chiapas made the Mexican peso tumble into a free fall. By the end of that year Mexico found itself in an economic crisis that paralyzed the sale of art. Interest rates soared and many of my wealthy clients had to suddenly sell their houses at considerable losses and look for business in other countries like Chile or the United States. Under such circumstances, people cannot think about buying art; they are worried enough with their immediate future. Even buying groceries becomes a serious concern. I remember the case of one friend who had been looking to buy a Mercedes Benz only he couldn’t decide what model he wanted. A few weeks later he was selling all his cars except for a quite modest one. I found myself in similar circumstance. A few weeks before the peso devaluated I had sold one painting over the phone for $4,000.00 dollars. I felt successful and optimistic. That mood fell instantly as I found my $1,000.00 credit card debt growing rapidly with compounding interest rates, and no prospective clients for my art in sight. As a painter artist and a parent of three school age boys, my situation was critical. I called the wife of one possible client and offered to sell a small painting she had expressed considerable interest in for half the price. She asked for a little time to consult with her husband. After a few hours she called back and politely said: “my husband says these are not art buying times…” and she was right. Note: this is great! Just what I was looking for. It pulls it all together, yes? I felt worried and anxious. “Is this Señorita Trini, secretary to Don Augustin Legorreta?” I questioned in my best voice laden with authority. “Yes it is, Sir,” I could almost see her smile respectfully through the telephone. I hung up and sent my portfolio by messenger to Don Augustin Legorretta. To my great surprise Trini did call back two days later to invite me to meet Señor Legoretta for coffee in his office at the grand bank building on Paseo de la Reforma and Periférico. The Comermex Plaza building stands 22 flights high in one of Mexico City’s most fashionable and historic areas. Ten minutes before the appointed time I went through tight security and walked through the ample marble alleys of the building’s numerous elevators. Little lights with numbers and bells indicated nervous activity. Nobody would have thought of me as an artist dressed up in my tweed suit , a remnant from my days as entrepreneur and insurance broker. I felt somewhat good about of my appearance, yet inside I suffered. What would a man with all the means to buy the best art think of my own artwork? Up I went to level 22. The elevator door opened wide and after a brief wait I was ushered to a large office with a lounge, a library and two comfortable seats by a coffee table. At my feet a wonderful view of Chapultepec Park with Maximilians Castle in the middle. Higher on the horizon of the vast Anahuac valley the two snow-capped volcanoes, the Popocatéptl and the Ixtaccihuatl reflecting splendorous sunshine after a bit of afternoon rain. At one time, Mexico City was known as “the most transparent region” — not very often nowadays. Don Agustín arrived shortly. He was all you would expect from a well polished gentleman. Note: perhaps a little more description of the man here or dialog, what he said. He showed me around his art collection. Magnificently carved Estofados or wooden Catholic icons from colonial times, plated with gold and silver, paintings from Mexican masters and commemorative silver trays. Note: I for one would like to know more details about what he had in his art collection and assume art collectors of your work and reading this book would too. You could also include your observations, for instance a piece that struck you, what you thought when you saw it and so on. Then we sat and discussed my situation. He was very understanding and basically accepted some kind of bartering with the single condition that it would not ever be repeated. I did not ever want to be in the present situation, at the mercy of a bank, either. Suddenly, he stood up and asked me to follow him to floor nine: the bank’s meeting room and directors dining hall. As we walked out of the elevator we came into a wide room with a bare wall about 28 feet long, 6.5 feet high before us. Would I envision a mural there? He asked. Of course, I answered yes. He then asked me what subject I would choose for the mural. I took a few minutes to answer, while he suggested themes with historical portraits. Then it came to me. I gestured with my arms the width of the image I foresaw: peppers! Mexican peppers, red and green, jalapeño and poblano, making an attractive pattern with the national colors. I was afraid he would not like it…but as it happened, he did. He immediately phoned his cousin for approval, the well know architect who had designed the dinning area. I suffered through a two day waiting period, and to my surprise, the famous architecto Legorreta said the idea of the peppers was great! And so I began painting to pay my credit card debt, through three weeks of painting — and wining and dining with bankers., with my signature and many happy memories of how every day a butler named Prócoro would call me to lunch in distinguished company. Its funny how, under those circumstances, bankers seemed so friendly. The rumors of a mural being painted on the 9th floor soon spread all over the bank’s building. In an environment where people spend their long work hours looking at numbers and money transactions, a painter and his product surely will stand out. So many clerical workers found reason to take an elevator trip and have a peek. Among my visitors came a group of secretaries on their way to lunch, some half a dozen of them, mostly atractive and smart -as bankers often choose them. They came behind me quietly and stared, not meaning to disturb my work in anyway at first. I could feel their looks at my brushstrokes from behind. Closer and closer they came quietly, until I turned and gave them a warm hello. They answered with giggle and continued watching quietly ..till one of them cracked a question: Sir? why so many peppers when one single good one would be enough? On another occasion, Mr.____ who at that time held an important position at the banks board, was showing some investors around; five or six gentlemen in grey and navy suits, white collars, gold cufflinks and cologne. They stood quietly watching, like the girls had done before. Again, a wise crack, this time from the prominent banker, who ceremoniously proclaimed: “…and this, gentlemen, is the graphic expression of our current interest rates”. 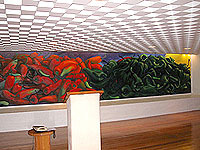 You can still see the mural of the peppers in the ninth floor. I tried this same strategy with other credit cards, but their conditions were abusive and offensive, so I paid them slowly with money instead of art, since it was the only value they knew.